No one keeps St. Catharines more comfortable that Reliance. From Stoney Creek to Fort Erie to Niagara-on-the-Lake to Port Colbourne and all around St. Catharines, Reliance Home Comfort™ is where you can always count on your Home Team Advantage™ for total home comfort. That's because Reliance offers 24/7 support by phone and the best customer service experience, courtesy of our friendly and experienced Home Comfort Advisors. Got a question about heating, cooling or plumbing? They'll know the answer. We also have professional on-site experts who are fully licensed and regularly trained – including service technicians, water heater installers and furnace and air conditioner installers – so you'll always know you're getting the best systems and service, from tune-ups to preventative maintenance, repairs and more. Reliance has also designed a variety of Comfort Protection Plans that protect you from the worry and hassle or unexpected repair costs and make sure the heating, cooling and plumbing in your home are always functioning as they should. Your home comfort starts and ends with Reliance. Give us a ring – we're always happy to help. Hi, I'm Mario, a Sales and Installation Manager who partners with Home Comfort Advisors, HVAC Service Technicians and HVAC Installers to grow the personal and professional brand of Reliance Home Comfort in the Niagara area. After spending more than 25 years in the trade, I know how important it is to bring a winning attitude with a shared goal to do our best work each and every day. In 2015, I was honoured to receive the “President’s Award” for exemplifying Reliance Home Comfort’s Guiding Principles and going above and beyond what was expected of me. I continue to work in the Niagara area to motivate constant improvement, shared learning, inspire excellence and hold each team member accountable for their commitments to our valued customers. Hi there, I'm Terry. I'm a Home Comfort Advisor with Reliance Home Comfort and I love the opportunity to help homeowners with their heating, cooling, and on-demand water needs in the Niagara Region. I really enjoy seeing my customers happy once Reliance finishes installing their new furnace, air conditioner or tankless water heater. I spent over 25 years in business-to-business sales before deciding to make a career change that would make a real difference in people's lives – that's why I chose to work with Reliance Home Comfort. 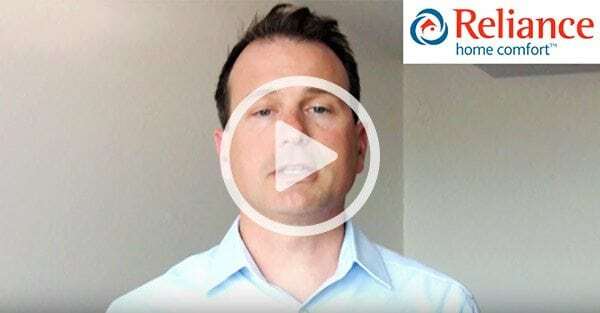 I'm Trevor and I work as a Home Comfort Advisor for homeowners in the Niagara Region. For me, true success means being able to help customers find a solution that helps them to achieve maximum comfort in their own home – whether it's a tankless water system, air conditioning or heating. I completed training at the Reliance Centre of Excellence and while in this program I earned team the MVP award voted by team mates and finished top in my class. When I'm not working, I enjoy helping out with local charities and events and I'm always willing to give my time. “People helping people” – that's what it's all about! Reliance team members have rolled up their sleeves, hammered nails and painted walls, so that deserving families in our area can afford a comfortable home. Watch the video to see Reliance team members at work for Habitat for Humanity. We’re proud to support this Niagara Resource Service for Youth that helps kids living on the street and those at risk learn skills for leading healthy productive lives. In 2016, Reliance donated $10,000 to the cause and made available team members to volunteer anytime they needed our help. Reliance sponsors the local Ontario Hockey League team and cheers them on as they play to win in the newly built Meridian Centre. 10/10 experience. From the sales visit with Terry who took the time to answer all of my wife's questions and concerns to the installers Rob and John who installed our new AC to Tyler and Will who installed our new tankless and than back to Terry who visited the day of install to make sure everything was ok. Amazing group of people who truly care about your needs. It really rained the day of install and they never once complained. Haven't tested the AC yet but our family of 5 LOVE the tankless water heater...Thank you Team Reliance! "Fantastic experience. Terry Warren was an easy going sales guy, no pressure, willing to explain and answer questions, readily pointed out energy rebate options. The two install tech's (Rob and Patrick) were courteous, personable and patient with a curious home owner. Did a really nice install job and cleaned up well afterwards. New furnace, new on-demand hot water heater and AC unit, all installed and working same day. Highly recommend! "Matt, Fred and Terry were all very professional. When asbestos was found under my 60 year old furnace, they were on the phone within seconds to get taken care of. Terry set up financing for me quickly and Matt and Fred put in new unit as fast as they could. Kept room neat and tidy and cleaned better than it was before started work. Could not have asked for better service!! Matt #2842 and Fred #2962. Terry Warren, St. Catharines office." "We just had central air conditioning installed in our home. From signing of the contract to installation, it was 24 hours. This is outstanding. The crew (Fred and Rob) were professional polite and went above and beyond to ensure the system was installed, and working properly, and looked good, before they left late that evening. Thank you to them and the company, for this "cool" feeling."